Breaking news: There is a new candidate for most useless invention in the history of people fermenting stuff and getting blitzed off the result. 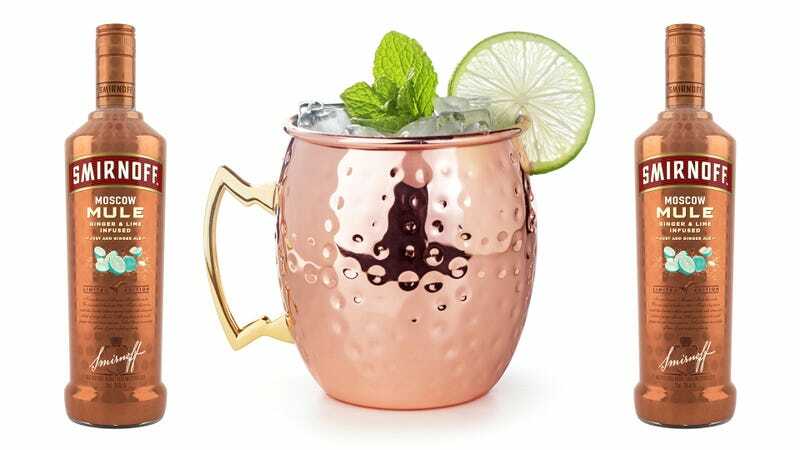 Smirnoff announced this week that it is releasing a limited edition Moscow Mule-flavored vodka, “a powerful flavor combination of zesty ginger and tangy lime.” That sounds like an okay proposition by itself. Could be a fun, dumb shot, maybe. Now, at-home cocktail creation is made even simpler with SMIRNOFF Moscow Mule. While the Original Moscow Mule cocktail was made with SMIRNOFF No. 21 Vodka, ginger beer and lime, cocktail adorers everywhere can use the new ready-to-mix SMIRNOFF Moscow Mule variant to make an even easier version – just add ginger ale (or ginger beer). So this is saving you fresh lime juice, which is a) insanely easy to get and b) a delight. If you’re me, it’s also saving you a few dashes of aromatic bitters, which is how I was taught to make great mules by my friend Wally Anderson, the general manager of Rogers Park Social in Chicago. But again, that’s so simple. This vodka is saving you one or two really simple things that make drinks way better, while not actually saving you from having to seek out really good ginger beer, which isn’t always super easy to find. Thanks for nothing, Moscow Mule-flavored vodka.